There are 3 reviews of Roses Elixir. ROSES ELIXIR is the kind of scent you should wear if you feel light-hearted,kind of playful and if you are relaxing on a Saturday,going shoping,eating out, going to a movie,or just walking on the peer, it also makes you feel girly and like you are ready for a party. Sweet,Elegant,Flirty,Luscious,desirable, Sensuous,Independent and Simply Surprising. It is a delicious mix irresistible sweet red fruits (strawberry) and precious florals(jasmine and rose),infused by a sensuously smooth base of cremy amber and vanilla makes a delicate balance of softness and strength.it makes you smell flirty and sensual at the same time.sweet but not tht overly sweet smell that makes you nauseous. 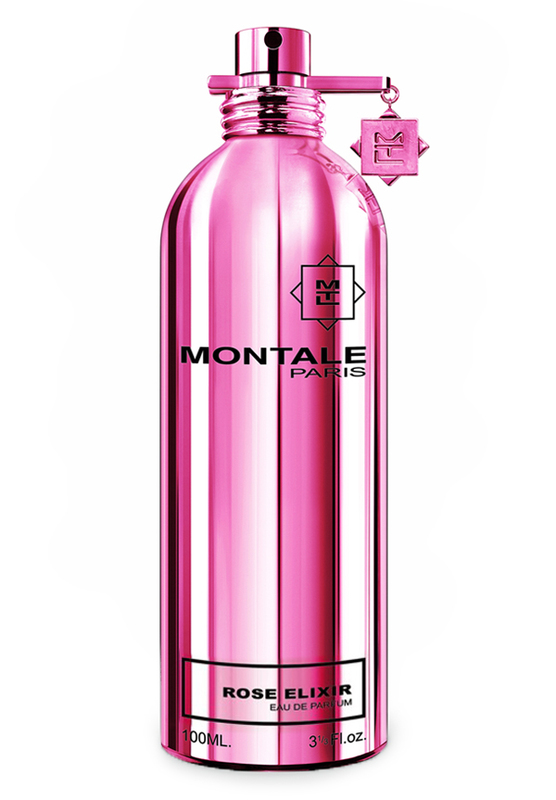 This mixture is evocative of delicious.It is appeal to the young,playful women for whom it is intended to be the perfect day to day accompaniment.so yummy for Springtime.perfect gift any women will enjoy.it reminds me a Flirtatious girl.definitely worth trying.you can not go wrong with MONTALE perfumes. Initially, Roses Elixir is a pleasant, rich, round (synthetic) rose scent, radiant and bright, sweetened by resinous and almost caramelised notes, and a dusty-sweet base of vanilla and mossy-green notes (perhaps patchouli and woods). The prominent fruity note - which is listed as strawberry but smells more like a generic ethylmaltol note which can be anything - enhances the "gourmand" feel. Yet the rose manages to keep up with its role, supported by other flowers - I smell something white and slightly creamy, like ylang, and a pollen feel. Above this, an aromatic breeze of citrus and neroli. Nothing special, nothing creative, nothing "artistic" and a bit plain, still it's pleasant, nice and luminous. An average, lively, "pink" rose scent. The drydown is predictably a bit metallic and generic given the amount of "plastic" this scent is made of, but I wouldn't say it's unpleasant - just a bit conventional. Unworthy the price if you are looking for something good and special, but may work as a gift for people with average-to-low pretenses. This smells overwhelmingly of sweet strawberry jam to me for most of it's duration, with a rosy, clean musk & a touch of amber in the base. As with most Montales, the sillage is huge, but unusually it doesn't last much beyond three hours on me. Worth a try if you love sweet fruity florals, but much too sweet for me. There are no member images of Roses Elixir yet. Why not be the first?